The colors of Spring 2009 include a wide variety ~ from the soft chiffon colors of Rose Quartz, Lemon Quartz, Pink Amethyst, and Green Amethyst . 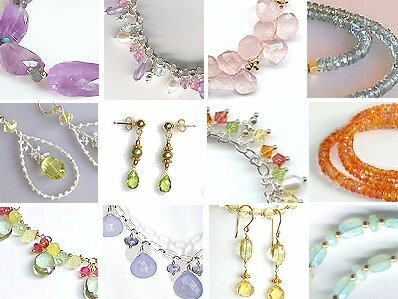 . .
to the hothouse brights of Pink Tourmaline, Orange Sapphire, Peridot, and Yellow Citrine. 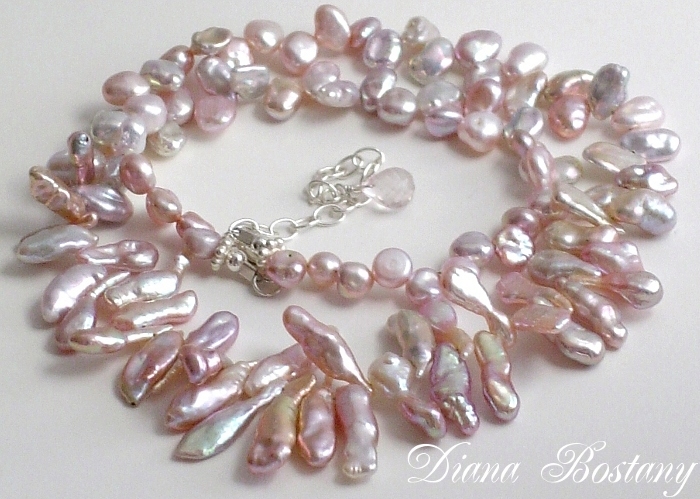 For a taste of something in between, try Peruvian Pink Opal, Peruvian Blue Opal, Pink Coral, and Blue Chalcedony. Texture plays an important role with textured chains creating matte finishes, diamonds in the rough, and pearls. While classic pearls are hot, hot, hot, Frangia pearls pick up on the fringe trend and in the case of these lavender ones below, show a rainbow of pastels within their luster.